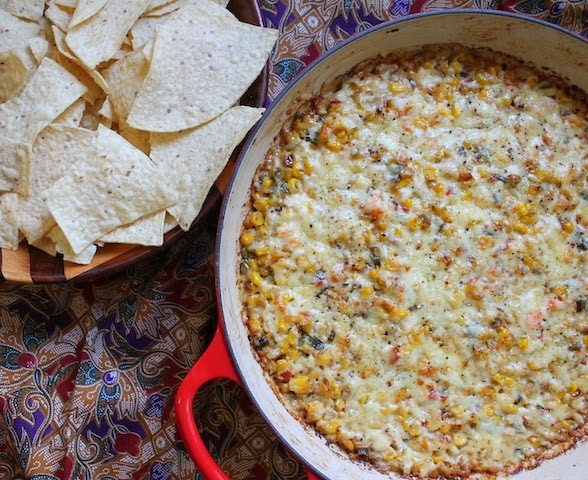 This spicy, extra cheesy baked corn dip with shrimp will become a party favorite. For a vegetarian version, substitute chopped black olives for the shrimp. Today is the biggest game day of the season for those who follow American football. It’s the championship they call the Super Bowl and it’s a pretty big deal even for folks who don’t have a team they normally support in the game. Over the years, we’ve woken up at some pretty bizarre times to watch the Super Bowl, because live television was the only way to catch the action. Now, with one-click record at the ready, we can watch at our leisure the next day, at a decent time and eat things like chips and dip. (Nobody but me feels like chips and dip at 3 a.m., which is such a shame.) Anyhoo, I’m just here to tell you that I will be scarce on social media on Sunday evening and Monday, until we can watch the recording, because folks do persist in giving blow-by-blow accounts of the game as it is played and I don’t want to find out like that! Sort of ruins the fun, I’m sure you will agree. What I wouldn’t mind a blow-by-blow of, on the other hand, is what you are serving so feel free to share those leading up to the game! The best part of Super Bowl watching parties is always the food and drink. If you are still dithering over what to make, the Sunday Supper group has got you covered with 50 great recipes for any game day! 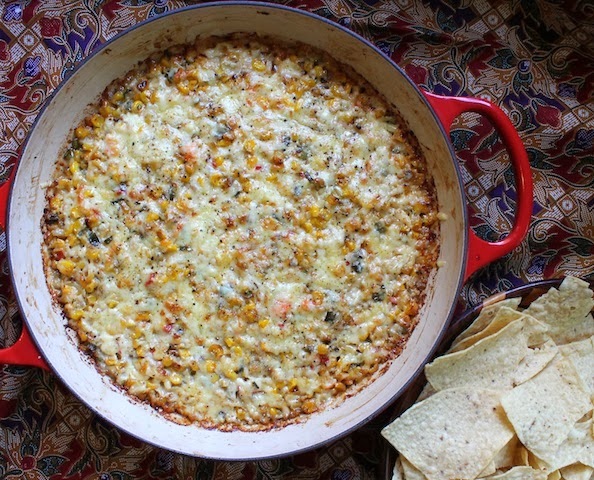 I can highly recommend this cheesy corn dip with shrimp. I brought it out sailing yesterday and even at room temperature, it got rave reviews. If you have a pan that can go from stovetop to oven, use it. Otherwise, we’ll do the first steps in a skillet and then transfer everything to an ovenproof dish for baking. In your pan of choice, cook the shrimp with a drizzle of olive oil until they are just cooked through. Remove them from the pan and chop roughly. Set aside. In the same pan over high heat, add another drizzle of oil and fry the corn until it gets a little browned or even charred, stirring every once in a while to keep it from sticking. My lighting is poor but it really does have browndy bits. Meanwhile, preheat your oven to 350°F or 180°C. Mince your onion, green onions, red chili and jalapeño and grate your cheddar cheese. When the corn has some nice browned bits on it, remove it from the pan and set aside to cool a little. Add yet another drizzle of olive oil to that same pan and, over a medium heat, sauté the chopped onions and peppers until everything is soft and the onions are translucent. This will take about 10 minutes. Stir regularly to avoid the onions scorching. Remove the pan from the heat and add in the corn, chopped shrimp, cream cheese, mayonnaise and about two-thirds of the grated cheddar. Give the whole thing a good couple of grinds of fresh black pepper. Stir well to combine. If your pan is ovenproof, spread the mixture out evenly and top with the remaining cheddar cheese. Otherwise, transfer to a baking dish and do the same. Bake for about 15-20 minutes in your preheated oven or until the dip is melted and the cheese on top is bubbling. Don’t bake it too long or the oil starts to separate out of the cheese. Serve with tortilla chips for scooping up big bites of the dip. Check out all the delicious party food we’ve got for you this week. Appetizers, main courses and sweet treats – there’s something for everyone here. 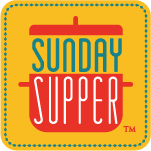 Many thanks to this week’s Sunday Supper host, Heather from Hezzi D’s Books and Cooks! And may your own favorite team win! This sounds wonderful! The shrimp, corn, and cheese sound like the perfect combination for Game Day! Yummmm! I need this dip in my life. I have to make this! I LOVE that you added shrimp to the dish. Enjoy your game day…a day after mine…but NEVER too late!! Your dip is just beautiful! I would love to scoop my chips in it or heck eat it with a spoon!!! Mmmmmm - I will be making this. I love corn and what a great way to use it. What I would really like to have is that amazing looking dip!! We are having today garlic knots, hot artichoke dip, spinach dip, chips and dip, cheesies, hot wings, BBQ wings, teriyaki wings. and of course the Italian rolls of today!! Oh I might whip up some cookies too!! Being a Bronco fan for over 30 years and living in Denver, you bet it's a big deal around here. And spicy corn dip, where have you been all my life? Wish I would have had this recipe for today..so pinning to try later. And aren't LeCreuset's just the best for displaying great food. Thanks for sharing and GO Bronco. Oh my gosh Stacy, I love, love, love this. I've got to make this. I could even see this as quesadilla filling. And thanks so much for your help on how to track down links on FB on the #SS page yesterday. Really appreciate it! Very creative dip! And I love your presentation!!! Fancy with the shrimp and delicious. Tortilla chips? Oh no! Just give me a spoon. I would not want to waste even the smallest bit of stomach space on chips so I could have more of this. Bring me the big spoon too. Some of this may or may not have been eaten directly from the pan with a spoon. I am admitting nothing! Thank you, Kathia! It was. I think I'm going to add bacon and shrimp next time, Liz. You are most welcome, Susan. It would be good in a quesadilla, I think. I was also considering piling it on rounds of toasted baguette and putting them under the broiler to get brown and bubbling. So much potential in this dip! I won this one from a fellow Sunday Supper member's giveaway, and find I am using it most everyday! I've been avoiding the news till I can watch, but I hope your team won! That's quite the menu, Tara! I wish I could come to your house to watch the game! It turned out really yummy, Conni. Yeah, a spoon works great too, Jennifer. Not that I would know. It's never too late, Betsy! You do, Nichole! It was very tasty. Thank you, Heather, and thank you so much for hosting! Thank goodness for that! I won't even tell you a single thing about the Super Bowl! :-) Happy watching!! I watched my first Superbowl this morning - the alarm went off at 615am and we got to the hotel at 645am for a champagne brunch. I have to admit to eating and drinking a lot more than actually watching the game though. I was pretty clueless. This looks like perfect game food - much better than anything I had this morning!!! Stacy! This Spicy Roasted Corn Shrimp Dip looks heavenly! If you made this, I'd be with you at 3am eating this pan of deliciousness!!! yum! and although I'm happy about the outcome, I wish the game were a little more exciting! Ackkk, Alice! I told you not to tell me. I knew who you were rooting for!